The penultimate round of the series was Saturday’s Tuffmac Trailers Lakeland Stages Rally. Hosted by Enniskillen Motor Club Ltd, it comprised eight classic gravel stages, and attracted a quality line-up. 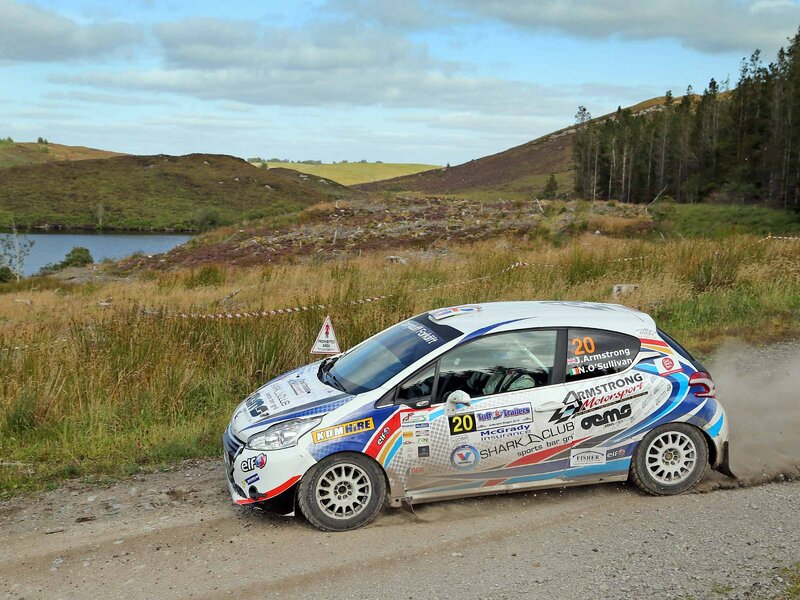 There were some notable CFR2Wales absentees, however, including County Londonderry’s Callum Devine – who doesn’t yet have a gravel kit for his Opel Adam – and Dunmurry’s Kyle White. He, too, was unable to source the necessary components needed to transform his car for the forests. Kevin Eves had been due to travel from Donegal, but a replacement wiring loom failed to arrive in time. Those that did start included Kesh’s Jon Armstrong and he made his intentions clear right from the opening stage. He set the fastest time of all CFR2Wales crews, stopping the clocks a whole three seconds faster than event newcomer and perennial rival, Rob Duggan. The Citroen C2 of Alan Smyth was a further six seconds in arrears, closely followed by 19-year-old Adam Bustard. Ian Dickson and Isle of Mull native Fergus Barlow were having steady runs, occupying fourth and fifth respectively. Armstrong continued his push on stage two – ‘Big Dog’, extending his lead at the front further after Duggan slid off the road and got stuck. With no way to free the car it marked an early end to his and navigator Ger Conway’s participation. Their demise moved Smyth up to second and Bustard up to third, with the top three positions remaining unchanged over the longest test of the day – the 12.27-mile blast over ‘Ballitempo’ – and the short ‘Belmore’ stage, which marked the mid-way point. Conditions remained largely settled for the afternoon stages, and Armstrong’s experience on gravel from his forays in the Junior European Rally Championship came to the fore as he continued to put more daylight between himself and the chasing Smyth, who felt much happier having firmed up his car’s suspension at lunchtime service. But it wasn’t enough to catch the runaway leader, and at the finish in Enniskillen, Armstrong’s margin of victory was an impressive one minute twenty seconds. Castlederg’s Adam Bustard recorded his best-ever finish of the championship so far by recording a well-deserved third place finish ahead of the similar Ford Fiesta R2 of Fergus Barlow. The top five positions were rounded out by Ian Dickson, who climbed the leaderboard as the day progressed. The action now moves to Omagh for the Bushwhacker Rally, which takes place at the end of this month (September 25). It is the seventh and final round of the Carryduff Forklift Road To Wales series with Jon Armstrong, Alan Smyth and Rob Duggan still in the running to land their dream drive. Until then you can keep up-to-date with the latest series news by following @CFR2Wales on Twitter or visiting www.road-to-wales.carryduff.co.uk.